It’s the summer of 1936, and the writer Stefan Zweig is in crisis. His German publisher no longer wants him, his marriage is collapsing, and his house in Austria—searched by the police two years earlier—no longer feels like home. He’s been dreaming of Ostend, the Belgian beach town that is a paradise of promenades, parasols, and old friends. So he journeys there with his lover, Lotte Altmann, and reunites with fellow writer and semi-estranged close friend Joseph Roth, who is himself about to fall in love. For a moment, they create a fragile haven. But as Europe begins to crumble around them, the writers find themselves trapped on vacation, in exile, watching the world burn. 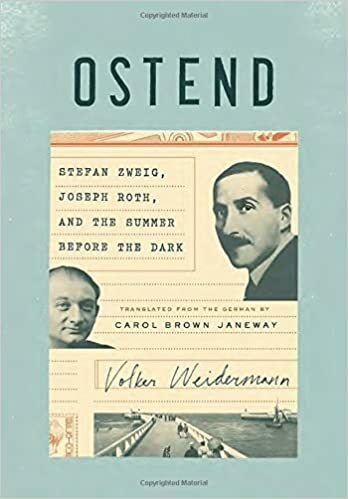 In Ostend, Volker Weidermann lyrically recounts “the summer before the dark,” when a coterie of artists, intellectuals, drunks, revolutionaries, and madmen found themselves in limbo while Europe teetered on the edge of fascism and total war. Ostend is the true story of two of the twentieth century’s great writers, written with a novelist’s eye for pacing, chronology, and language—a dazzling work of historical nonfiction.